Typical Traffic in Lagos Nigeria. Photo credit: BBC World Service via flickr. For the first Sunday in a while, I got to skip church. I had planned for Sunday for days. As there was no traffic on Sundays, I was going to Victoria Island to meet a friend for boozy brunch. 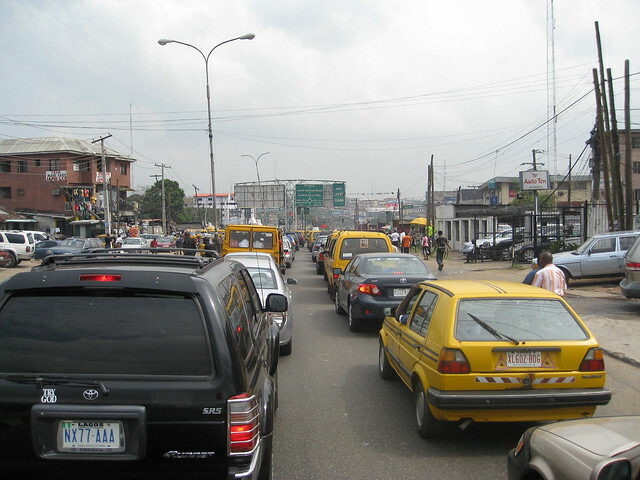 Typically, getting from Festac to Victoria Island could take up to 2 hours or more due to traffic. But on Sunday, there were fewer cars on the road and it could take me as little as a half hour to get to Victoria Island. I had planned my “island” outfit: my crop top with a fitted pair of jeans. Compared to Festac’s lower brow population, Victoria Island is home to Nigeria’s biggest “Afro-sophisticates”. Those Nigerians who schooled abroad and whose parents owned physical and metaphorical oil wells live on the “Island.” For me, going to the Island meant I could pretend for a small bit that I was in one of the great metropolises of the world, like London or New York. I thought about simply hailing a taxi and arriving in Obalende, a major bus stop in Ikoyi. But then I considered the cost benefit of boarding a bus to Mile 2 then to Oshodi and finally to Obalende. I picked the bus. The morning had finally arrived. As everyone prepared to go to church, I prepared to go to the “Island.” That morning I was determined to avoid my grandma for fear she would see the thin line of exposed skin between my crop top and my jeans. She didn’t seem to notice as she too was getting dressed. Finally ready, I quickly walked to the junction to catch my first bus to Mile 2. 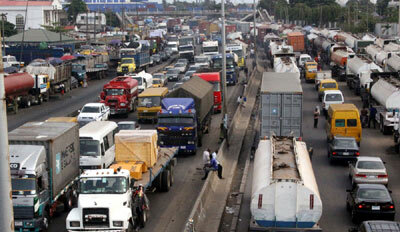 Oshodi-Apapa Expressway on a typical day Photo credit: Vanguard Newspapers. On the bus, I looked carefully around me to make sure there were no obvious thieves. Next to me was a fair yellow girl with long braids. In her hand, she held her purse and a book with the title “Hell is the destiny of sinner.” Rereading the title, I wondered what she must think of me in my crop top and line of exposed midriff. I settled that she must have thought I was a sinner. After all, I was skipping church, wearing a crop top, and going out for boozy brunch. Reaching my bus stopin mid thought. I quickly got off the bus (you learn fast that in order to avoid being screamed at, it is best you do everything quickly in Lagos). I headed swiftly towards the Oshodi-Apapa expressway, anxious to run across and climb over the 3ft high median to reach the other side of the highway. Then, I was stopped. The conductor called me after me saying “Where are you going?”. Uncertain of why he asked the question, I returned. “Obalende,” I responded in the uncertain tone I would summon when talking to strangers, in the hopes they might believe I was new to the city and spare me the usual yelling I somehow “deserved.” He and the bus driver told me to get back on the bus and continue to the next stop where I would more easily find the bus I wanted. I explained that I planned to cross to the other side of the highway, board a danfo bus to Oshodi and then another to Obalende. Ushering me back on, they assured me that their suggestion would help me avoid all the “corna corna” stops. After returning to an almost empty bus, where it was just me and my fair yellow friend. I began to suspect that I was called back not because the driver wanted to be helpful but because he’d noticed my line of bare midriff. As I pondered this realization, the driver sat in the bus next to me and began drinking a small bottle of rum. As if on cue, the conductor pulled out a sachet of dry gin. They began to converse about how the alcohol would make them high and asked the fair yellow girl if she agreed. She looked at them with disgust and exclaimed, “Look at what you are doing on a Sunday morning.” I smiled politely at the conversation, wondering about the difference Sunday morning made. Were these men’s lives more bearable because it was a Sunday? I concluded that it wasn’t; their lives were the same, but without traffic. Eventually, I put aside every MADD (Mothers against drunk driving) message I had ever heard and decided that these men would safely drive me the 500 yards to the final bus stop. After all, it was a Sunday and in Lagos there is never traffic on Sunday. This post is the 2nd in a series on navigating Lagos by danfo bus.